Cook It Allergy Free iPhone App Is On Sale Now!! 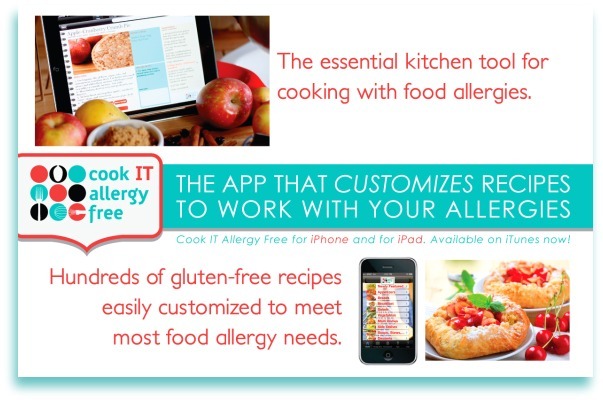 The Cook It Allergy Free iPhone and iPad Apps are on Sale…for the month of September ONLY! Almost everyone is back to school now. The days of summer are officially behind us (even if the temperatures do not feel like it) and we are now, once again, faced with our rushed mornings trying to get out of the door, hectic afternoons filled with after-school activities, and busy evenings full of homework and dinner routines. In honor of this event, for the month of September only, I am doing a special price reduction for the Cook IT Allergy Free iPhone App and iPad Apps. I thought it would be appropriate since we could all really use a tool or two that would help us to navigate these busy days. And although the App cannot make your breakfast for you, or finish your daughter’s homework, or get the dinner on the table, it can help to create meal plans, shopping lists, organize your recipe box, all customized to your family’s food allergy needs. You can see from the video that this is a tool to help families who are navigating the challenges of cooking for those with food restrictions and specialized diets. The Cook It Allergy iPhone and iPad App provides a tool at your fingertips for those living with Celiac Disease, Autism, or Food Allergies or Sensitivities. The App has more than 200 gluten-free recipes that can all be customized to meet each user’s individual food allergy and dietary restriction needs. I will also be adding close to 100 more recipes, including many for the upcoming holidays, over the next month! Recipes have been contributed by many of the leading bloggers in the gluten-free and allergy-free community. Alisa (of Go Dairy Free and Alisa Cooks), Lexie (of Lexie’s Kitchen), Shirley (of gfe-gluten free easily), Zoe (of Z’s Cup of Tea), Jenny (of Creative Cooking: Gluten Free), Rhonda (of Allergy Sense), Michelle (of Allergy Sense), and Sarah (of Sarah B Designs)…. these women have helped to create an invaluable resource and have given a gift to this project. Find tons of great tips and tricks for gluten-free and allergy-free cooking that will help to give you delicious results in the recipes. Share recipes and cooking tips with your friends through Email, Facebook, and Twitter directly from the app. Save recipes to your Grocery List to have all of the ingredients you need, including your substitutions for your allergens, at your fingertips for easy shopping. Organize your Grocery List By Aisle or By Recipe. And you are also able to add items from your daily home list as well. Check off items as you shop →clear single ingredients, entire recipes, or your entire list with simple taps. Have offline access to your Recipe Box anytime. Keep your own notes within each recipe to remind yourself of what you liked or did not like about a recipe. Find endless tips and FAQ’s on how to use the App. The iPhone Version is available for $3.99 at the Apple Store. And the iPad Version is available for $6.99 at the Apple Store. Just got my app!!! Thank you!!!! Yay!! April! I hope you enjoy it! 😉 I am about to add a huge number of new recipes, so be on the lookout! Is this app available for Android? I am totally going to buy one for my IPAD, but my phone is a droid. I cant wait to try it. Hi Jessica! We have been working on an Android version. Just ran into a couple of snags. I will update everyone when it is available, though! I just bought your app. Thanks for all you do on this site! life is hard enough when you can’t eat what’s around you without making a big effort, I appreciate your app, I don’t have young kids but taking care of myself is certainly a handful and this makes life that much easier! thank you!! Love your blog and looking forward to using my new app. Thank you for this wonderful new app! I immediately downloaded it yesterday, when I saw it on facebook and am very impressed with what I’ve read thus far. Of note, I was charged the regular price of $8.99, plus tax at the Apple store. Kerry, thanks so much for downloading the App. I am so sorry you got it yesterday. What time did you purchase it? I believe you have 24 or 48 hours to refund the App. Then you could re-purchase it at the sale price! Glad you like it so far though. More recipes are coming. I think the app sounds like a wonderful convenience. Hurry with the android app please! This is fabulous! I just downloaded the app, so I haven’t had a chance to use it but I suspect that it is going to rock! My fiance and his family, as well as my Dad are always calling me for gluten-free subs in cooking. There is a very likely possibility that they will be receiving this app for Christmas gifts. On a side note, I was reading your bio and, like you, I am going into school for nutrition. I would have to say that being forced into a gluten-free diet was the best thing for me. I love cooking and baking and I’ve learned so much about nutrition. My fiance rolls his eyes when people start asking me about what I eat because I can’t stop talking about the amazing things that I’ve discovered/created. This is great! I am going to download the app. Thank you for the sale. Thanks so much for this sale! I’ve looked at the app once before when Heidi (Adventures of a Gluten Free Mom) mentioned it. Glad she mentioned it again today so I could get in on the sale. Looking forward to putting it through its paces. What an awesome idea. I am new to the dairy free thing and find is so frustrating when it comes to trying to think of what to make for dinner and such. It seems like everything we ate had dairy in it somehow. I will have to buy this app for my iphone; I believe it will help me out a lot! Thank You! Waving “Hi” to Sonya! So funny to be reading the comments, checking out this app and see your sweet mug next to your comment and think, hey, I know her! Let me know how the app works out for you, I’m intrigued. This is such a great idea! I have been in need of something like this! Thank you for sharing!!! Wow I can’t believe you have this on sale. I love this app. I have it on my iphone and my ipad. It’s great. I love the features, especially that I can adapt and save and also I’m offered options. Oh and the grocery list is cool too. I was referred to your site by a friend and I can’t wait to try this new app! Maybe going gluten free won’t be so difficult after all! As someone newly diagnosed with Celiac, I am so glad to find all of these wonderful options open to me! Makes this seem not so overwhelming of a diagnosis. I am new to this and just bought the app!! Thanks!! Hi Lee Ann!! Let me know if you ever have any questions about the app or just about gluten free and allergy friendly cooking in general. I hope you enjoy the app! I really think this is so neat. I need to avoid many different foods because of intolerances. I really like recipes. I really like recipe books and trying new things. Yet I seem to be in a funk when it comes to adapting my old recipes with my new needs. I do not have an i-phone or ipad. Which is a huge bummer, because I really like this and think I would use it a lot. I love the idea of using this app, but I have an android tablet. Any news yet on the development of an app for this platform?